Cute little Audi A1 Sport. Presented in Brilliant black metallic with half leather sports interior. 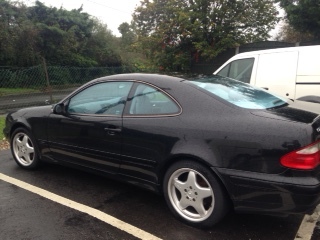 Fitted with unmarked 16" 10 spoke alloy wheels shod with excellent tyres. Sports spec includes Heated half leather seats, Multi function steering wheel with Cruise and Audio functions, Concert Radio/Single CD Player with MP3 File Compatibility, DAB Digital Radio, SD Memory Card Reader, AUX, 6.5in Display Screen, Electric windows, etc. The car has had just 1 lady owner and is an excellent example of the marque. It has covered a shade under 28000 miles and has a Full Audi service history. Just serviced and new MOT done. It is in fantastic all round condition and drives perfectly. Supplied with the handbook pack, previous service invoices and 2 original keys. For an appointment to view please call Kevin anytime until 10.30 pm 7 days. We're just 2 mins from J3 of the M3, Baghsot, Surrey. Usual dealer facilities - Part exchange, PCP, Competitive finance and various payment solutions.